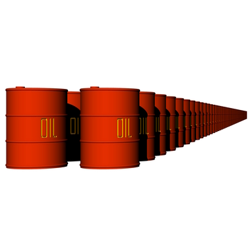 The US Department of Energy released its weekly crude inventories a day late due to the Memorial Day holiday, showing an unexpected build of 3 million barrels to 397 million barrels overall, a record since the 1930's. However, US crude oil rallied $0.66 to $93.53 on speculation that the Fed will keep its loose monetary policy in place following a bout of weak data. Today, all eyes in the commodity spread betting markets will be on the OPEC meeting in Vienna, with the output target predicted to stay the same at 30 million barrels. We finally had that successful break above the $1,400 mark for gold prices, which rallied $21 yesterday to $1,413.9. A weaker dollar undoubtedly helped, but a step back in the US recovery may have also brought back some demand for asset preservation. In the face of a weaker US dollar, which usually supports oil prices, Nymex crude oil plunged $2.20 to $92.84 yesterday, taking its direction from the slumping stock markets. This may suggest that the energy sector is also a tad nervous about Bernanke cutting asset purchases. As for OPEC, the signals so far suggest that there is no intention of changing production targets. A lower dollar pushed gold CFD prices $11.9 higher to $1,393.1 yesterday, with the rise benefiting from reports that the biggest bullion backed exchange trading products are on the increase. However, the precious metal seems to be on a consolidation trend lately, with any attempt to break above the $1,400 mark remaining elusive for now. Despite talk about the abundance of crude oil in the US, especially when shale oil exploration takes shape, the improved economic picture still offers good support for the energy sector. As such, WTI crude prices rebounded $1.44 to $95.02, largely on expectations that a better economy will push up the demand for oil. As seems to be customary of late, gold prices responded to the perception of how the US economy is likely to perform. In this case, the precious metal was hurt by the optimism in the housing sector, losing $13 to $1,380.8 after investors decided to move into the dollar. Ahead of an OPEC meeting where a production target review is on the cards, the United Arab Emirates energy minister suggested that the current price of crude oil is 'suitable and fair' and does not affect consumers. However, the strength enjoyed by the dollar is still putting downside pressure on US crude oil, with the market losing $0.20 to $93.64. Reports of ongoing central bank buying, coupled with some light bargain hunting, pushed the gold market $6.5 higher to $1,394.5 yesterday. Nonetheless, the fact that the $1,400 mark remains elusive, given the steep falls of the last few weeks, invites investors to remain cautious for the short-term at least. WTI crude oil started the day on the back foot following the unexpected shrink in Chinese manufacturing figures. Nevertheless, the market managed to pare its early losses towards the close and even posted a $0.28 gain to $94.10 after the US housing data demonstrated some resilience. Gold spread trading investors took Bernanke's speech as a sign that the withdrawal of QE is coming, although they acknowledged that it is not quite here yet. Coupled with the slowdown in Chinese manufacturing, that gave them a good enough reason to jump back into precious metals, pushing gold prices $22.4 higher to $1,390.5. The US Department of Energy released its weekly oil inventories report yesterday, which indicated a rise of 3 million barrels in gasoline stocks against expectations for a decline of 300,000 barrels. Energy investors reacted swiftly, sending WTI crude prices sharply lower and, with a stronger dollar accentuated the plunge, the market finished $1.77 down at $94.10. Gold investors must have surely cheered when Ben Bernanke warned about tightening too soon. However, few were expecting such a quick u-turn, with the Fed Chairman acknowledging the chance of a scale back in QE if the pace of jobs recovery allows it. As a result, the precious metal reversed course, dropping $3.8 to $1,369.6 for the day. With no clear evidence of rising oil demand even though we have entered the US driving season, the price of WTI crude oil fell for a second session yesterday, losing $0.96 to $95.90. This came despite weakness in the US dollar, which usually offers support, as today's US Department of Energy inventories report is predicted to show another overall climb. The ongoing rally in equities delivered a renewed blow for gold investors that were hopeful of seeing a meaningful rebound. With so much pushing and pulling over the asset purchasing program, investors decided to discard the precious metal once again, with the market dropping $18.4 to $1,374.8. In commodities spread betting, gold closed around $40 higher at $1,393.4 yesterday, but is dropping off this morning due to a stronger dollar and continued outflows from exchange-traded products. The precious metal has dropped by around 20% so far this year in light of an improving global economy and record highs in the equity markets. This has caused a lot of investors to shift their portfolios so they can take a slice of these higher-yielding opportunities. We are also seeing falling physical demand and many are expecting the Fed to stop its monetary easing measures which could add downward pressure to the price. It seems that the only glimmer of hope in the near-term is for the Fed to maintain its current stance. Brent futures for June delivery closed at $104.74 yesterday, approaching the $105 mark on concerns that rising Middle East tensions will outweigh demand worries. The market has seen some downward pressure recently on worries about sluggish growth in the key economies where the most Brent is used. On top of this, inventories have been growing, however, the predicted fall of 400,000 barrels in today's numbers may aid prices if it does turn out to be the case. Gold closed at $1,354.6 in the last session and is down by around 13% for the first quarter due to a large sell-off in exchange traded products. This has outweighed demand from bargain hunters in Asia and China that have been locked in a tug-of-war battle with the bears. This morning, the metal is heading south for an eighth straight session, to its weakest level in a month, on fears that the Fed will reduce their monetary stimulus measures. This would dent gold's appeal as a hedge against inflation which such easing measures have been known to stoke. With equity markets hitting record highs, the temptation for investors to be a part of the wave has caused them to dump gold in favour of riskier opportunities. Having said that, many would argue that buying into the gold market at this point could be riskier still. Brent crude for June delivery closed at $104.56 in the last session and was approaching the $105 mark earlier this morning on upbeat economic data and as equity markets continue to impress. Asian shares are on the up after encouragement from US equities, with sentiment in the world's largest economy hitting a six-year high. Despite this morning's moves, prices have been weighed on by this year's projected weaker demand as well as increasing stockpiles.